There aren’t too many things more frustrating than hitting a putt only to see it dance around the top of the cup and ultimately defy gravity. Apart from short-range putts ‘skimming’ over the holes edge because they have been hit with excessive pace, the reason that 99.9% of ‘lip-outs’ happen is due to ‘excessive sidespin’ having been imparted onto the ball. 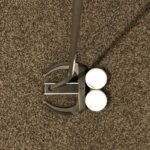 At impact, if the ‘toe’ of the putterface strikes the ball fractionally before the heel, anti-clockwise sidespin will be imparted onto the ball – conversely, if at the moment of impact the heel of the putterface strikes the ball ahead of the toe, it will impart clockwise spin onto the ball. Both are detrimental to holing putts. When either of these faults is exaggerated, it results in even more ‘sidespin’ being imparted. Sidespin on a golf ball not only reduces its chance of holding the intended line, it also pretty much guarantees that if the ball doesn’t hit the hole ‘dead centre’ it will stay above ground. To encourage a ball to ‘hug’ the putting surface and also to dive into the hole when ‘floating’ over a lip, you need to eliminate all sidespin and instead impart ‘negative overspin’. 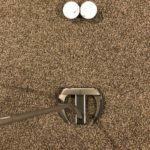 The following practice drill will give you instant feedback as to whether or not you strike your putts with a ‘square clubface’ and may explain why ‘lip-outs’ are all too common. It can be done on the putting green but initially, try it at home on the carpet. Take 2 golf balls and glue them together using a blob of ‘no more nails’ (see picture 1). Assume your set-up position so that the face of the putter is ‘flush with/touching’ the back of both adjoined balls (see picture 2). Without taking a backstroke, push the putter through what would be your normal impact position. The idea is to get the ‘adjoined balls’ to roll forward 8 inches or more in a straight line without ‘swerving’ to either side (see pic 3). Once you have become proficient at this, the real test will be hitting a few short putts to see if your stroke delivers a putterface at impact that will produce a similar result. If the toe of your putter strikes the far ball before the heel of your putter strikes the near ball then they will swerve to the left and not roll forward –if it is the heel of your putter leading into impact they will swerve to the right.